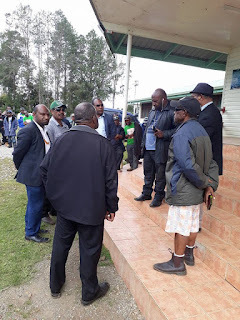 Candidates contesting Papua New Guinea’s Ialibu/Pangia Open Electorate in the Southern Highlands province have accused Prime Minister Peter O’Neill of “rigging” the country’s national elections. “Today confirmed everyone’s worst fears – these elections were deliberately rigged from the start,” said Stanley Liria, one of the candidates who signed a formal protest letter with election manager David Wakias before polling began in the electorate. The open electorate is where Prime Minister O’Neill is the incumbent MP. The rival candidates claimed in their letter the electorate was not ready for polling today. The candidates are Jerry Kiwai, Nepoleon Rema, Tua Yasa, Stanley Liria, Justus Rapula, Leonard Pangepea and Dr Sam Kari. At a meeting at Ialibu District Office, they unanimously agreed that certain issues be “properly addressed” before polling started. Their letter was registered with the manager Wakias. Candidate Liria said people were fed up with corruption, dictatorship, lying, stealing, and “treating people like dirt”. He said the people of Ialibu-Pangia were peaceful and hard working, and had the right to choose their new leader through a “fair, transparent and honest” process. “O’Neill is denying you this constitutional, democratic right,” Liria said. All candidates, apart from O’Neill, had “through blood, sweat and tears” visited the entire electorate on foot and seen the “disastrous lack of services and conditions” people had to endure, Liria said. These issues represented grave concerns for the integrity of the Ialibu-Pangia elections, and so the contesting candidates had served notice with manager Wakias. Stanley Liria is a Lawyer by profession and a close associate of Peter O'Neill. However, both men decided to take different routes when it comes to elections. When Stanley wants to nominate as a candidate in June, there was a minor mishap whereby he almost miss out on the closing day with other candidates. PNG Media reports that the electoral office in the Pangia district have been closed soon after Peter O'Neill nominated himself. The rest of the candidates have to come all the way to Ialibu District to nominate on Friday which was the last day or else they would have missed out to contest. This, some claim was deliberate but who knows. The Electoral Officers may have some other business to do on the day. With a convoy of about 60 plus vehicles and multitude of supporters marching to Ialibu Station, Liria finally nominated with other candidates. He could not pay his nomination at Pangia Station because of the forced closure of the nomination office for a week. This incident raises eyebrow of candidates and voters but was finally put to rest. There are many reports of cases about polling errors occurring everywhere in PNG and Pangia Ialibu could be of the districts to address electoral roll issues before going to the polls. But what is most striking is the strong revivalism between Stanley Liria and Peter O'Neill getting momentum each day supporters. The two men were once good friends and perhaps still good buddies but decided to travel on different direction on political matters; something which in PNG not so often. Politics relatively is connected to every walk to life be familial, tribal, business and so forth. Like many districts in the country have petitioned the EC office, let be the Ialibu Pangia candidates and the result be out and polling commences.